Here we go then, the start of a new wedding year. For many couples, the journey of planning their wedding has begun and so begins some tense talks over very detailed spreadsheets and a stack of wedding magazines that can serve as your coffee table for the next 12 months. In light of this, I’ve been trawling all things wedding to bring you my first ‘WEDDING INSPIRATION’ blog post and this time I’ve gone all rock chick. Let me start by saying that for some, finding their wedding inspiration is very simple. They’ve had most details of their wedding mapped in their head for sometime and know exactly what they want. For others, it’s not that easy. At a recent wedding fair I was talking wedding style with a bride, I asked her if she had any colours in mind. Her blank expression said it all. 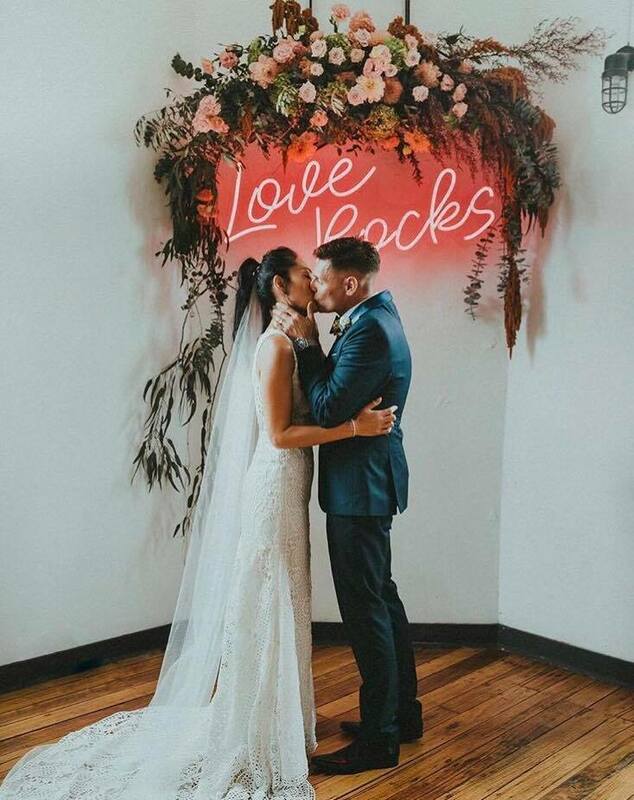 She said “I literally haven’t got a clue.” If this is something you can relate to then you might find looking for wedding inspiration a little overwhelming. So with that in mind, let me take you through this look. If you like something with a little bit of edge, perhaps with some quirky touches using non traditional wedding colours, then this might start the creative juices flowing. Think cool and unconventional. For me, this look is less about rebellion and more about individuality. Incorporating darker, richer colours combined with the elegance of metallics will give you a wedding with attitude. More pretty delicate florals can also be incorporated to add a touch of romance. I will forever be a fan of candles as part of wedding decor. Using thick pillar candles, varying the heights and sizes will create a warming atmosphere against the backdrop of darker colours whilst also bringing a sense of occasion. And course - there’s adding a bit of leather to the proceedings. Mixing up different textures and materials in whatever form, adds a sense of style and when their personalised like these, it adds a special touch. I also think these jackets a great alternative bridesmaid gifts. To add a real element of individuality and uniqueness to your wedding then check out Photo Press Uk. Sarah creates bespoke newspapers that can be used as invites, orders of services or thank you notes. She incorporates exactly what you’d like to say along with your favourite photos to create something really special and unique. Props and furniture are another way that you can add some real personality to your day and look no further than The Prop Factory. They have a great range of props and furniture and add their collection often. Browsing through their collection is a great place to start when looking for inspiration. If you’re getting married and would like help planning or styling your day then we’d love to hear from you! Get in touch for a no obligation chat over a cuppa and we can start dreaming up ideas to give you the wedding you’ve always wanted. The inspiration for this shoot came from this gorgeous field of flowers close to where I live. Having driven past it regularly, I couldn't ignore the burst of colour which was strengthening the more the sun shone. I took the colour of the flowers as the starting point for the table layout, using a lilac tablecloth. Lilac is a pretty alternative to other traditional neutral colours and has a bridal feel without being too feminine. Choosing a neutral colour such as this ts a great starting point to build upon when designing your table layout. I then wanted to mix in some other elements that would compliment the prettiness of the lilac. The metallic gold of the cutlery and candlesticks give the set up a sophisticated feel. I love the combination of soft and whimsical with the cool shine of the gold. The white and patterned china keep it looking clean and fresh whilst adding some texture and the grey napkin complimenting the lilac along with a small sprig finishes the place setting off beautifully. The flowers for this shoot were provided by the brilliant Hanna from Flowers by Tidbury, an expert bespoke floral service that creates beautiful arrangements. "I selected green lisianthus which are soft in colour and have delicate buds that give a romantic alternative to a rose. Larkspur also features, these are tall and elegant and a little shabby around the edges, offering a real rustic charm and adding height to the arrangement. Garcia spray rose has dainty buds and soft shell pink colouring. The perfect rose to add a little warmth without too much colour." RD Events offers a bespoke wedding and event styling service. Based on your tastes and preferences we put together ideas to help you create the look you want for your special day. Planning everything from table decorations, floral pieces and lighting, to china, glassware and linen. We can also source everything you'll need working within your budget, using the contacts we have within in the wedding industry to get you the best suppliers. For more information then please get in touch and we chat about how we can help. Que the bubbles, celebrations, the all important Facebook status change and hopefully an inappropriately sized novelty engagement balloon! Once the initial excitement of the engagement subsides and the reality of planning a wedding hits home, the anxiety sweats can start. Planning a wedding can be an overwhelming experience simply because there is so much to think about. Getting organised is the key to nailing this wedding malarkey. 1. Choose a date: Until you have a date you can’t make any bookings so this is the best place to start. 2. Guest list: Draw up a rough guest list so you have an idea of how many people you are planning to invite. Venue's and suppliers will want to know how big your wedding will be. 3. Set yourself a budget: Weddings can be costly so it’s important that you decide how much money you are going to spend on your day and on what. "Prioritise! If there’s one thing we could drum into your head it would be to know your priorities and put them at the very top of your budget list. If something is important to you, that’s where you want to spend your cash. Don't try to do everything perfectly, because unless you have Beyonce-level cash you'll end up frustrated and broke. Focus on the things that you both want to remember - some couples couldn't care less about the way things look, and would rather put on a playlist and invest more in an open bar and amazing food. For others, it's all about the music, baby, and a day of great entertainment." 4. Start making a list: Write down EVERYTHING you will need to organise for your wedding such as wedding clothes, flowers, food, evening entertainment etc. If you like a spreadsheet then this is when you can get your nerd on. Even include things that you think don’t matter at the moment such as beauty treatments before the wedding. This way you know you have included everything in your budget. 5. Start working through your list: Look at your list and decide what is the priority. Start with the first thing, get that sorted before moving onto the next. Go through your list in order of priority. The venue, ceremony and dress are usually the things that need to be done first. Delegate as many jobs as you can to your friends and family. 6. Research: Once you start on your list spend a bit of time on each point, do your research and get some quotes. A minimum of two quotes is usually wise but no more than five otherwise you may end up with too much to choose from. 7. Finally, enjoy! Its your wedding so pour yourself a glass of bubbly and enjoy planning this really special day. If you are looking for help with planning your wedding then RD Events would love to hear from you. We can help with everything from wedding planning and styling to on the day coordination and childcare.